Peninsula park with waterfront picnicking, boating, fishing, bicycle trails Location on a peninsula of a peninsula in the Penobscot River, this park has picnic spots on the waterfront, and pier for fishing and boating, and a scenic trail for bicycling. The park’s 120 acres nas a mile of rocky shore, a tidal sandbar, and lots of plants and wildlife. The rubble of of Fort Pownall on this site contain interpretive panels. Bicyclists can enjoy a seven-mile trail around Cape Jellison. Open Memorial Day to Labor Day. An entrance fee is charged. Situated on Route 9 about halfway between Portland and Lewiston-Auburn, this park is best for its wonderful views and for hiking on multi-use trails that allow horseback riders, mountain bikers and snowmobilers. (Snow shoe rentals are available.) West of Route 9, the Summit Trail is the quickest route to views from the top of Bradbury Mountain. Trails on the east of Route 9 are favored by mountain bikers. 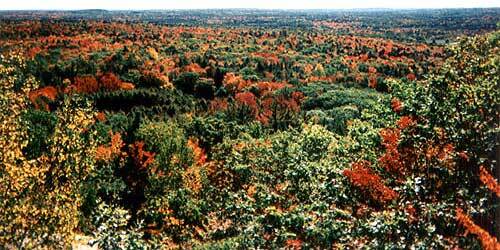 Fall is a popular time for visits by people to see the fall foliage and enjoy bird watching. Spring is best time to watch hawk migration; it is time for the annual hawk watch. Trail map -- west side. Trail map -- east side. Located on beautiful Segabo Lake at the foot of the While Mountains, this park has sandy beaches, extensive woodlands, ponds, a river, and a large range of wildlife. Swimming, sport fishing, and boating are some of the summer activities enjoyed by visitors. Also, motor boating, canoeing, fishing, and trail hiking. There is a boat launch that accommodates trailers. In winter, park visitors do cross country skiing and snowshoeing. There is a 250-site campground, with a group picnic shelter, playground, RV dumping station and hookups for electricity and water, and showers. Visitors enjoy walking on wooded and marked trail and bicycling on park roads. Open May 1-October 15 for full uses. Campground map. 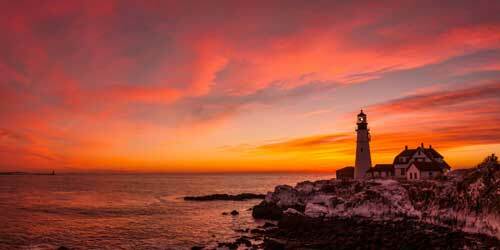 Quoddy Head State Park is on the tip of America's easternmost peninsula, and adjacent to the historic West Quoddy Head Lighthouse. Great place for a picnic, to enjoy scenery, and to explore trails along the cliffs. Visitors can the towering red cliffs of Grand Manan Island in New Brunswick, Canada, across the Quoddy Channel. Open May 15 to October 15. Lily Bay State Park is located on the shore of Moosehead Lake. Activities at this parking include birdwatching, motor boating, canoeing, fishing, swimming, trail hiking and walking, picnicking, and wildlife observation. There is a boat launch for trailered boats. There is a campground with a playground, showers, and an RV dumping station. In winter, cross-country ski trails are groomed and a parking lot for skiers and snowshoers is plowed. Visitors may use snowmobiles in the park. A 2-mile walking trail follows the shoreline between the beach and Rowell Cove campground, offering easy terrain and nice views out to Moosehead Lake. Fort Williams Park is large swath of land south of Portland and it includes the Portland Head Lighthouse, one of the most popular in Maine for visiting and photographing. The park has many paths for walking and bicycling, playing fields, picnic areas, and tennis courts. 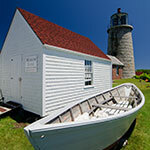 The tower of Portland Head Lighthouse is not open to the public, but the keepers’ quarters at 1000 Shore Road has a museum with many interpretive displays about these guardians of the coast ( 207- 799-2661). The park hosts several annual events, like family fun day and a Labor Day art show. The park is open year-round, sunrise to sunset. 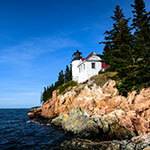 This magnificent park on the rugged coast of Maine is on Mount Desert Island; it surrounds the town of Bar Harbor. Visitors come for many attractions and activities, like bicycling, bird watching, boating, rock climbing, fishing, hiking, horseback riding, picnicking, scenic drives, swimming, skiing and snowmobiling. 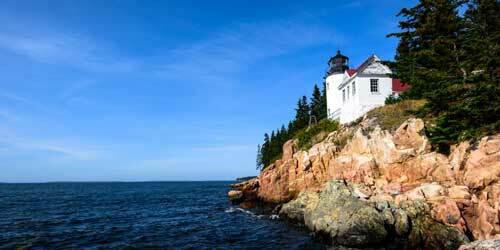 Featured places are Bass Harbor Head Lighthouse on Mount Desert Island; Cadillac Mountain; Isle au Haut; and the Wild Gardens of Acadia. The park is laced with 19th-century carriage trails for walking, biking, and driving. Visitor Centers: Hulls Cove Visitor Center, Route 3, and the Sieur de Monts Nature Center are open May through October; Park Headquarters is open November through mid-May. Park maps. Bordering the south side of the mouth of the Kennebec River, Popham Beach State Park has a fantastically long stretch of sand beach with views of offshore island and the the Kennebec and Morse rivers. Sand movement has had a strong effect on Popham Beach, causing shoreline change and dune erosion. 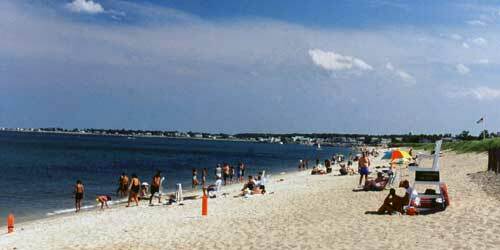 Certain tide conditions can result in high water and little sand area. Call the Popham Beach State Park's Hotline during the summer for current tide and parking information: (207) 389-9125. From October 1 to March 31 dogs are allowed on the beach, on a 4-foot leash. Good for picnicking, hiking and walking; an entry fee is charged. 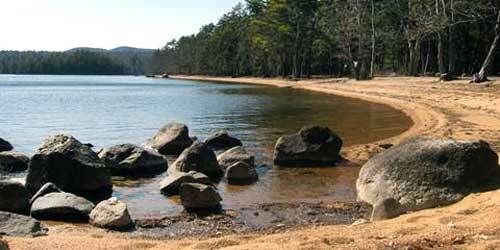 This state park features hiking trails, fishing and picnic areas. Five minutes from shopping and dining in downtown Freeport, the park has climax white pine and hemlock forests, a salt marsh estuary, and rocky shorelines on Casco Bay and the Harraseeket River. Season and Hours: April to October. This oceanfront park features a saltwater lagoon and Mile Beach. Visitors can enjoy swimming, fishing, boating, canoeing, and picnic areas. Open year-round. Good for walking and hiking, fishing, swimming, and boating. Visitors to this seaside park will enjoy the beach, ocean swimming, and fishing, not to mention spectacular coastal views of Seal Cove and Richmond Island Harbor. A snack bar and bathhouses are available. There are picnic tables with grills. Season & Hours: Memorial Day to Columbus Day. A fee is charged to enter the park. 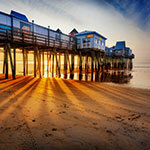 This small state park is located between Old Orchard Beach and Camp Ellis. Ocean beach for swimming, clam digging, surf fishing, picnicking. There is a changing room. Visitors can take a nature walk on a shaded trail. Dogs are not allowed on the beach from April 1 to September 30. Park is open Memorial Day to October 1. Day use fees are charged. Wild island with opportunities for hiking, camping, nature study. Ferry service to the island. Swan Island in the Kennebec River -- a state wildlife management area -- has unique river, forest and meadow habitats for eagles, white-tailed deer, songbirds and wild turkeys. The island has hiking and mountain biking trails, an overnight campground, and spectacular scenery. Kayak and mountain bike rentals are available. Ferry service from Richmond town dock is provided. Admission fees. On the west bank of the Penobscot River, Fort Knox is a well-preserved fortification that overlooks the Penobscot Narrows. The fort has many interesting architectural features. The fort is also the entranceway to the Penobscot Narrows Bridge boasts an observation tower, 420 feet above sea level. The tower provides a view of the Penobscot River Valley, and it is unique in the Western Hemisphere. 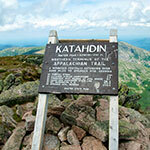 The observation platform has 360-degree views and placards naming the mountains, lakes and towns. Hours: Fort Knox is open May 1-October 31, 9 a.m.-sunset. The grounds are open year round. Cascade Park, the city’s most beautiful and popular park, features a lighted water fountain and a water fall that's more than 20 feet high. The park, which overlooks the Penobscot River, also has a small gazebo, picnic tables, and short walking trails. 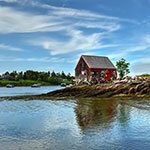 Shackford Head State Park covers 90 acres on Moose Island overlooking Cobscook Bay. This undeveloped park on a peninsula has beaches, coves, and a dramatic headland at Shackford Head. Several miles of trails cross the headland. An easy hike of one mile from the parking area through the woods to the rocky headland allows beautiful views of Cobscook Bay. No admission fee. Trail map. Hours: Open all year; daily, 9 a.m. to sunset unless otherwise posted. Camden Hills State Park is parked atop Mount Battie, with vast views of Camden and Penobscot Bay and its islands, Mount Megunticook, the highest peak in the park, is a moderate climb by foot trail. The family-friendly campground has hot showers, a group picnic shelter, picnic area, RV dumping station, RV hookups for electricity and water, and wireless Internet access. Activities at the park include birdwatching, camping, cross-country skiing, hiking (trails), horseback riding, off-road biking, snowmobiling, snowshoeing, walking, and nature viewing. Open May 15-October 15. A fee is charged. 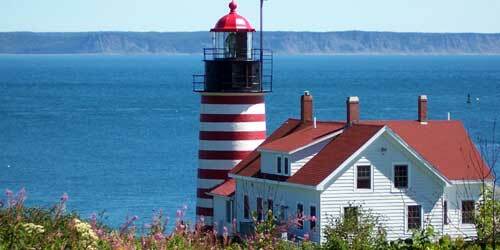 The park is located on Campobello Island in New Brunswick, Canada. Accessible by FDR Memorial Bridge from the U.S. town of Lubec, this was the summer home for President Franklin Delano Roosevelt. 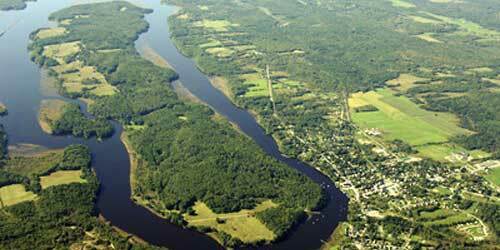 Now a 2,600-acre park, visitors can see the home or hike on more than eight miles of trails. Grounds open year round from a half-hour before sunrise to a half-hour after sunset. Visitor Center and Roosevelt Cottage open Saturday before Memorial Day through Columbus Day, daily, 9 a.m. to 5 p.m..
Cobscook Bay surrounds this park on three sides and offers the natural beauty of dramatically changing tides, from 24 to 28 feet, compared to an average of 9 feet along Maine's southern coast. The park has 106 campsites for tents and recreational vehicles (RVs) along a sheltered inlet within the larger bay. There is a boat launch, but boaters should be aware of dangerous rapids created by fast-moving tides. Lots of fun trails to explore. 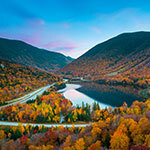 Grafton Notch State Park is in the mountains Mahoosuc Range. The land is rugged terrain for backcountry hikers. The reward for summiting these steep peaks is spectacular views. Visitors can find shorter walks leading to waterfalls and gorges. The park is part of the Maine Birding Trail, where people can see peregrine falcons and songbirds. Property is use in winter by snowshoers, cross-country skiers and snowmobilers enjoy exploring the lands. The popular snowmobile route ITS 82 runs across this region from Andover to New Hampshire's Trail 18. A wilderness of more than 200,000 acres, Baxter State Park is a hiking and fishing paradise. Within the park borders are 46 mountains, 175 miles of hiking trails, and 10 public campgrounds. Ample fishing and canoeing is available in lakes and streams, and regulated hunting is permitted. Baxter is also the northern end of the Appalachian Trail. Wintertime offers cross-country ski trails, snowshoeing, winter hiking, and limited snowmobiling. Season & Hours: Open year-round.